HOLLYWOOD, Calif. – “Immensely stylish and darkly funny” (Brian Viner, Daily Mail), director George Clooney’s suspenseful thriller SUBURBICON arrives on Blu-ray and DVD February 6, 2018 from Paramount Home Media Distribution. The film arrives on Digital January 23, 2018. 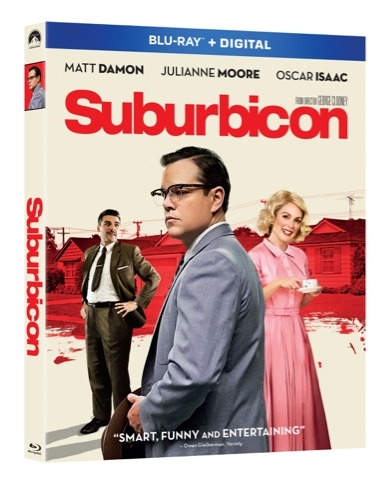 The idyllic town of Suburbicon is the perfect place for Gardner Lodge (Academy Award®winner Matt Damon*) to make a home. But beneath this tranquil surface lies a disturbing reality, where nothing is as it seems. When a break-in leads to the shocking murder of his wife, Gardner must navigate the town’s underbelly of deceit and violence to protect his family from further harm. “Full of twists and turns” (Marlow Stern, The Daily Beast),SUBURBICON also stars Academy Award®winner Julianne Moore** and Oscar Isaac.